RC helicopters offer hours of fun and enjoyment for all age ranges, both indoors and outdoors. With the hundreds of RC helicopters available today it can be difficult to narrow it down to just one. Some people have found it so hard in fact, that they buy many of them. They do this so they can have hands on experience to determine which are the best RC helicopters for themselves. ​Well, that's what I hope to help you avoid, wasting your hard earned money on a gamble. I want to be able to help you find the absolute best rc helicopter that fits your skill level and doesn't bust your budget. 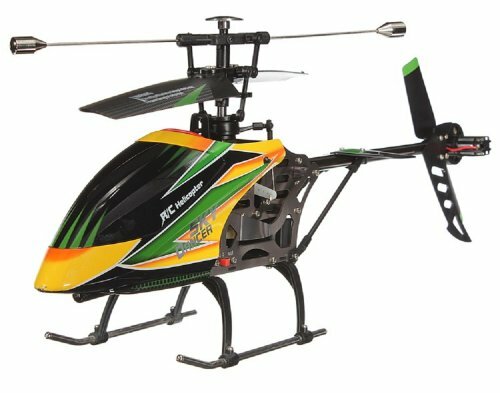 ​Sure, you can do a quick search for the best RC helicopters and you'll find plenty of reviews with attractive features, but short on details. It might be a bit overwhelming when trying to choose between the various helicopter models. ​Unless you know exactly what you're interested in, choosing the best RC helicopter is more complicated lately. Within the last couple of years there has been a huge growth in the number of helicopters available to us in all price ranges. ​But don't worry, I have prepared for you some excellent suggestions and tips that will help you in buying the best RC helicopter. Lets take a look at some different types of RC helicopters. Depending on your flying experience, budget, and time to commit on this hobby, there are various types of RC helicopters to consider. 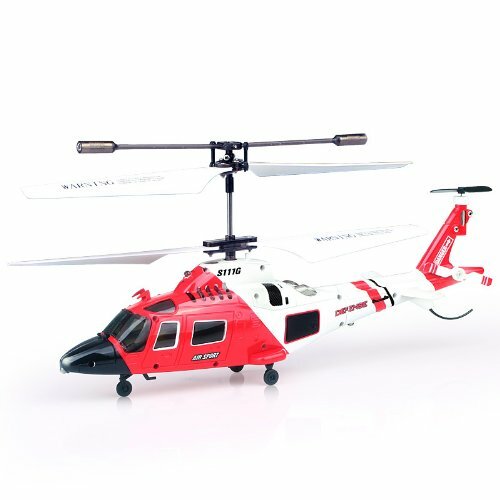 2 channel coaxial helicopter: These models are basically toys. They are the type of rc helicopters you see at Wal-Mart, they just fly up and are difficult to control. They don't play well with wind and will be jostled around in even minor weather conditions. They are great gifts for kids, but don't be surprised if it's broken by the end of the first week. 3 channel coaxial: Similar as 2 channel, but offering forward and backward motion. This motion is obtainable by the small propeller having a vertical axis on the tail, which can push the heli vertical to lean forward or backward. These will provide more control over the 2 channel models. 4 channel coaxial: We have a major jump up in price for these helicopters as a result of their increased complexity. They come with a swash plate operated by two servos. This helicopter can move forward, backward, left, and right. Some of them have gyros which fix the rotation issues of the coaxial design. 4 channel, single rotor, fixed pitch: You will find a big jump up in difficulty with these models. If you want to keep one in the air for longer than a couple of seconds, you will have to put in lots of hours of training. I wouldn't recommend this model for a novice pilot, it's inevitable that you will have a devastating crash and destroy your chopper. With that said, if you can master it, these helis are fast and highly maneuverable. 6 channel, single rotor collective pitch: Here we speak about serious machines. People usually spend years learning how to do stunning acrobatics with these helicopters. If you're interested, YouTube has some pretty impressive video clips of stunts being performed with this model type. These are not toys, they are far more advanced and way more expensive. In addition to the number of channels, there are other things to consider. For instance size does matter, if you plan to fly your helicopter indoors you may want a mini helicopter. These mini helis are pretty impressive now days and are more than capable of providing you with stable flight and hours of enjoyment. The brand may be the most subjective aspect of selecting a new helicopter. Simply put, a lot is put into marketing and personal choice when it comes to brand choice. This is mainly because brand standing is quite relative as each brand has advantages and disadvantages. What I look for in the different brands? A good brand must have good spare parts availability. The primary reason for this is clear: regardless of how great a pilot you are at some point you'll crash and break something. And if you don't, then overtime parts will wear out. You'll need replacement parts eventually one way or another. Customer service is important as well. If I buy a helicopter and it arrives with an issue, I want to know I can get it replaced quickly and at a low cost to me, or best case free. Or if I just have a setup question, its good to know I can make a quick phone call for some tips from someone knowledgeable of the product. Reliable brands will declare main specifications accurately, this must include the below information. Dimensions of the product: Main and tail rotor, length, height, width, etc. The exact number of channels of the helicopter. I'll also look for brand reviews or previous customer complaints. If I find too many negative comments about a specific brand on forums or of other places I'll tend to shy away from their products. Proper research can save a lot of time and money in the long run. Of course there are sour apples who will bash a brand or product for no good reason. You have to take some of complaints with a grain of salt. Align offers excellent helicopters. Despite the fact that some of them are quite pricey, the quality of their RTF Combo kits are fantastic. If you're a skilled pilot and able to afford an Align helicopter, then certainly consider Align. Their spare parts availability and customer support are top notch. Blade helicopters are really good also. Blade helis do not have the quality body parts and electronics that Align's have, but they are also no where near as expensive. They are still a reliable brand with great customer service. Syma helicopters are perhaps the most popular of all brands, they are quite affordable and they fly great. I've had the pleasure of owning many Syma rc helicopters over the years and they are some of the best rc helicopters available still. Some are brand loyalists and will only buy from that one brand. That's not me, I like to research and find the best products available, no matter who makes them. I'll compare features, read customer reviews, and check build materials to ensure I'm buying a quality copter. Here are a few other things to consider when buying a RC helicopter. For RC helicopters that run an electric motor, charging is one of the main factors that you need to consider when buying one of these devices. The types of battery packs used in these helicopters are nickel-cadmium (NiCAd), nickel-metal hydride (NiMH), and most recently lithium polymer (LiPo). Each one of these use a cell structure, with each squeezing a particular voltage into every cell. Generally speaking, nickel-based battery packs like NiMH or NiCAd provide around 1.2 volts per cell. On the other side, Li﻿Po is a better power source and these batteries are able to deliver around 3.7 volts per cell. So, flying time will rely on the number of cells plus the full voltage of the helicopter’s battery. This means that you will get more charge and obviously more flying time when you buy a heli with a LiPo type of power supply. The total number of channels that a helicopter has will greatly impact the complexity of flying. As a rule, more complex helis will have more channels which control additional features on the helicopter. Each radio frequency is sending commands to different parts of the helicopter. For instance, 1 channel will control the main rotor speed, while a 2nd channel will control the tail rotor speed. In a 3 channel helicopter, the 3rd channel will control the speed of another motor mounted on the tail boom. This motor controls the forward and backward pitch so it can move in those directions. 4 channel helicopters, the 4th channel is used to control the left and right movements of the swash plate, or the roll of the helicopter. Depending on your skill level and budget you can buy rc helicopters with 7 or more channels, these are professional grade helicopters flown by the most experienced pilots. These channels can control features like landing gear, video controls, GPS, fuel mixture controls and navigation. ​No matter what your skill level is, any RC helicopter can provide you with some outdoor fun and enjoyment. We all like to wind down after a long days work, and no better way than with a little RC fun. The below reviews will help you choose the best rc helicopter that not only fits your skill level, but also your spending budget. The first one up on my list has a single set of rotors, but still, is a fantastic flyer. The first thing you may notice with this chopper is the cool looking design of the canopy, I mean who doesn't like a shark. Not only that the canopy is sleek and modern, using an advanced design and paint scheme that looks awesome in flight. One main reason I like this helicopter is its rated for indoor and outdoor flying. Outdoor flight does need optimal weather conditions though, to much wind will cause you problems. With the model you have two flight options, the first is learning mode and offers greater control and maneuverability. The second mode, called experienced mode is considerably faster and has a tight control layout that is for higher skilled pilots. In flight, this RC heli is really stable as it uses internal gyroscopes to remain upright and maintains its balance well. The H911 utilized a servo cyclic control system to lean the single main rotor blade one way or the other. This movement enables the helicopter to change direction quickly. Along with the variable swash plate, you will have the greatest movements possible with an RC helicopter in this price range. The quality of this helicopter is backed by the many happy customers who've left positive reviews on Amazon. This is simply one of the best RC helicopters in this price range. This helicopter is a step up from the above mentioned, this one can be flown for a much longer distance, up to 150 meters. It can fly for up to 8 minutes on a single charge, but will take around 60 minutes to fully charge. This rc helicopter is loaded with features, one of which is 3D action. 3D flight is the ability to fly your helicopter upside down, and depending on your skill level is able to perform some fantastic aerobatics. Its 4 channels lets you fly up, down, forward, backward, turn right, turn left, left fly and right fly. The performance and features are not only what makes this heli so great, its artwork on the canopy is also top notch. The detail in the paint scheme is second to none. This helicopter offers high performance with a great price! You can read the hundreds of positive reviews on this chopper and know that you are buying a quality product. The Syma S111G is able to match many levels of flying experience. It offers a great level of performance and stability which perfect even ﻿﻿for a beginner. This machine also has the features that more professional users need when they are starting to improve their skills. With its many features, the Syma S111G is a good long term investment. You'll be challenged even more as your flying skills improve. 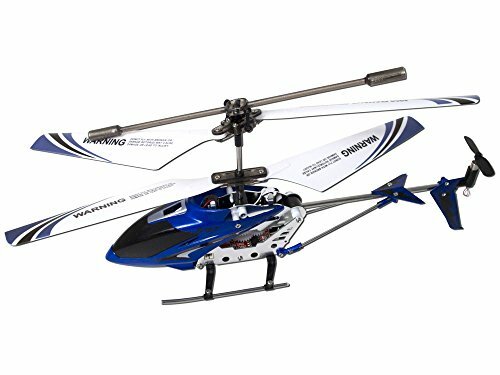 This will be evident quickly for novice pilots, this helicopter is durable enough withstand many crashes and keep on flying. On the whole, the Syma S111G is a great device for the people trying to improve their skills without needing to buy a more advanced RC helicopter later on. This heli has the ability to change into the helicopter that you want with a much harder handling to test your skill level. If you want to buy a solid rc helicopter to match your skill level, but also have an interesting design you need to consider this helicopter. This RC helicopter brings many advantages and benefits for its pilots. With a 4 star rating backed by over 1700 reviews on Amazon, this is all the proof you need know your getting a quality rc helicopter. I believe one of the main reasons this rc helicopter is so incredibly popular is because it's model after the Apache. Its an intriguing design and people absolutely love the looks of the Apache. I'm in the same boat, its awesome looking. Syma S109G is simple to fly in whatever direction you want, particularly when you gain some experience and learn how to use this heli properly. Also, it is a perfect device for all beginners mainly because it offers incredibly stable flight and movements. This RC copter is also supported by its durable Li-Po battery which can last for a quite a while. The brushed motor is also here to ensure good performance and a fun time whenever you are flying. The Syma S107G is perhaps the most popular rc helicopter on the market today. Mostly because it's affordable and out performs its low price tag. First off the Syma S107G is easy to fly, and that's what attracts its many happy customers. For a beginner or somebody just looking to have a little fun the in house, this is the absolute best rc helicopter for you. The internal gyro offers stable flight, and the brushed motor delivers enough power for quick maneuvers. 3 channels provide up and down, forward and reverse and left and right turn ability. With an extra .5 channel allows you to control the lights. The 3.7v Li-Po battery takes around 30-40 minutes to fully charge and gives you approximately 7 minutes of flight time. Depending on your flight actions you can get extra time out of the battery, some have reported around 15 minutes. You can choose to charge directly from the USB cable or from the controller. It's control distance is limited to around 10 meters, so if you looking for an indoor rc helicopter this is the perfect choice. Durability isn't an issue with the Syma S107G, the metal frame construction and flexibility of the rotors give it long life span. However, in the event you do manage to crash and break a part, there are many replacement parts online for this model. If I were going to recommend one rc helicopter to anybody, this would be the one. Its easy to fly, affordable and super fun. ​Here are a few other notable RC helicopters that deserve consideration, each one offers great value for the money and are solid choices. Making a choice on an RC helicopter is harder now than ever before. 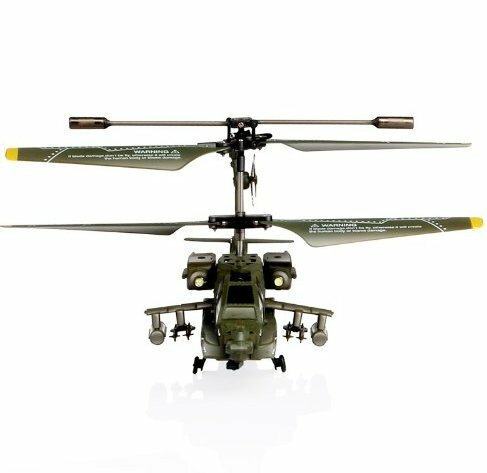 With a huge selection of models to select from, selecting the best RC helicopters seems to be an overwhelming task. But if you consider some of the tips I have mentioned above, and start with a recommended model you'll be just fine. Just remember, learn the basics first, and make sure to choose a rc helicopter that fits your skill level and can withstand a few crashes. If you get those right there is no doubt you'll have a the best rc helicopter for some flying fun!